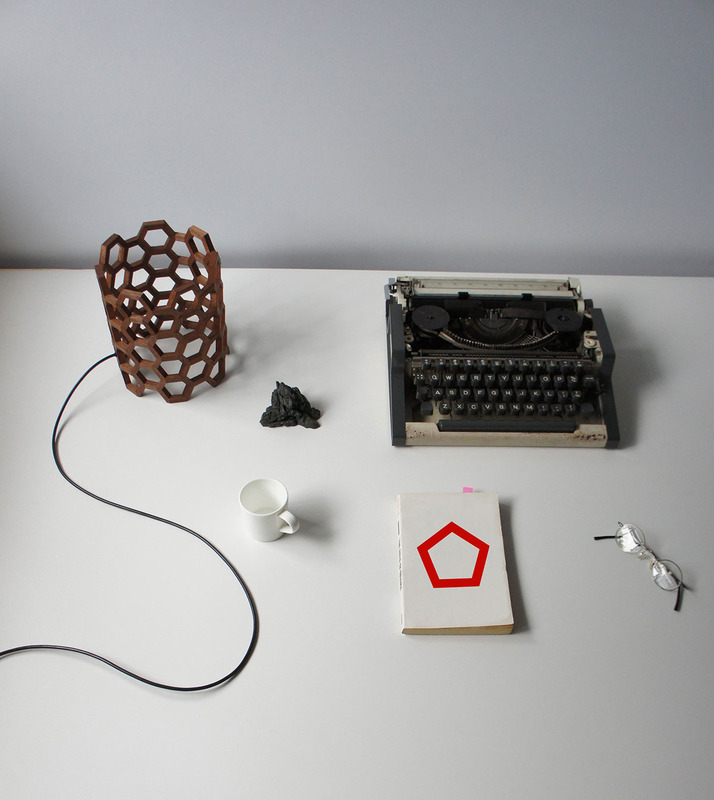 The ‘From Within, From Without’ (2012) table lamp is a logical continuation of the ‘Koan’ (2011) light. In the 'Koan', light seems to shine from within the emptiness of a wire-frame representation of an archetypal lamp. 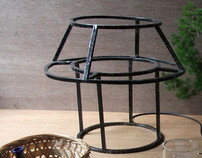 Here, that distinction between the lamp’s inner and outer space is made more salient by a perforated enclosure circumscribing a column of air. Most lampshades are translucent surfaces that intercept the rays from a light bulb, softening the glare concentrated in a tiny spot by distributing it over a larger surface area. These shades conceal the light source, becoming a glowing volume of softer light. Yet they also remain visually solid, palpable masses; when light is in fact an ephemeral phenomena with no physical form. The 'From Within, From Without' lamp is more a delineation of space than a discreet object; essentially nothing more than a thin boundary partitioning the brightness within from the darkness beyond. The mysterious, paradoxical quality of light is preserved and highlighted: something you can see, but not touch. For this prototype, wood veneer is overlaid on a supporting substructure; but the actual product would be assembled from individual pieces of CNC-machined, solid wood. 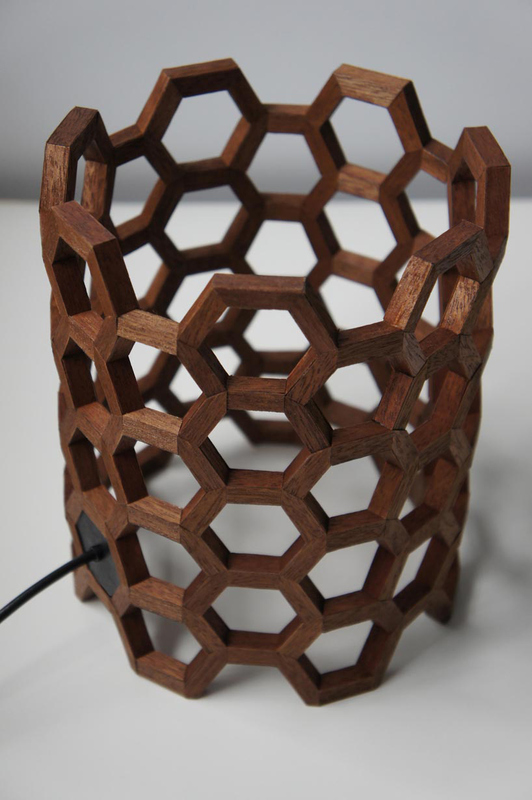 Although LEDs are used; I chose wood to keep away from the hi-tech, precision engineered image of most LED lamps. I wanted the technology to be invisible, and the focus to be on the effect of the light, not the means used. You see a low-tech, vintage-looking wooden structure with a modern electric cable sticking out of it like an incongruous tail and think, "What a strange object.. What can it be for?" Then you flip the switch and the circle of wood seems to mystically coax light to materialize from thin air. 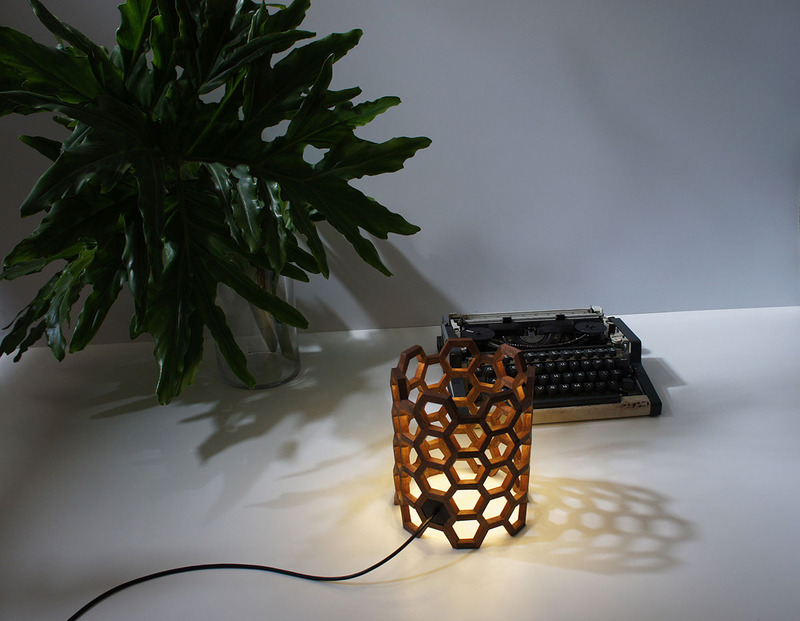 The ‘From within, From without’ lamp aims to be a Borgesian object, the light seeming to originate from neither inside nor outside the wooden cylinder, creating a luminous liminality. This design began as a concept for a light that refers to the natural relationship between sunlight and windows, how our most common experience of light is of it filtering into a room from the outside through the interstitial device of the window. 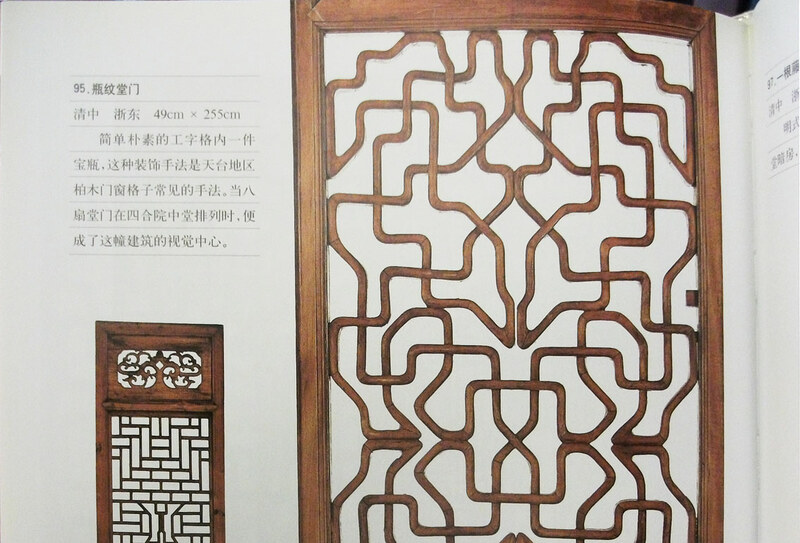 It was supposed to be a flat standing illuminated screen, based on traditional Chinese lattice frames. However, in the lamp's context of a desk, I could not find a justification for having a screen you can look through, because it would usually be just a blank wall behind. So I thought, why not curve the screen and close it into a cylinder of space instead? A gesture crystallizing the duality between inside/outside that was only implied in the Koan (2011). It's almost as if a window had been curved into a circle, trapping the sun's rays within its emptiness, like a bowl. Each individual ‘window’ is lit from above by a single hidden LED bulb. Paper or translucent white acrylic 'shades' are necessary to soften the harshness of the bare point-source LED light, which casts messy multiple shadows. 54 individual warm white LEDs were used in all. 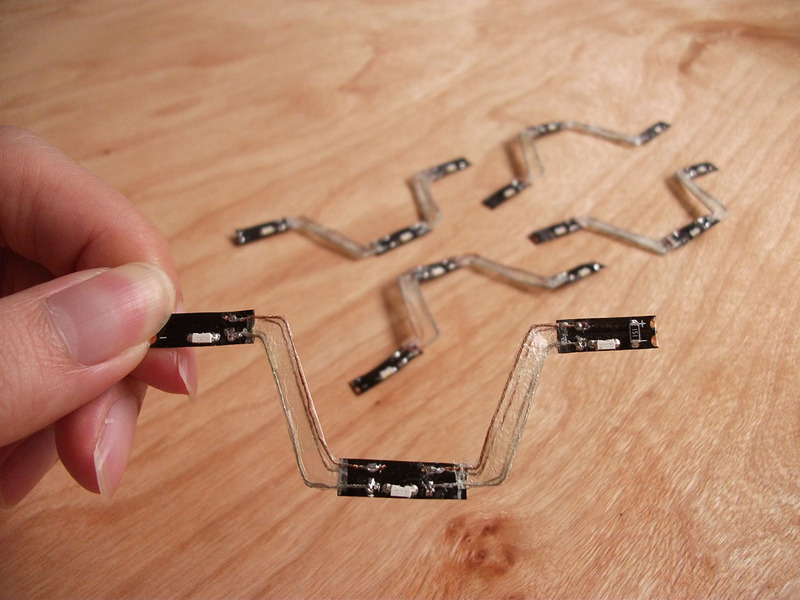 This prototype uses reconfigured, off-the-shelf LED strips; though light-emitting polymer or OLED strips would be the ideal choice (but they are currently too expensive, not bright enough, and hard to work with). Again, it doesn't matter what technology I used as long as I get the effect I want. It's as if the rays of an invisible sun were shining through the surrounding apertures from some point in the center. The illusion is enhanced by how the outer-facing surface of the lamp is darker than the inner-facing surface. This is due to each LED being positioned nearer to the inner side of the recess above each 'window'. The hexagon is a common motif, and may not seem like the most imaginative choice; but the point here is not visual expressiveness, a pattern that is too fancy would have distracted from the concept. On the other hand, the hexagon's mathematical timelessness is also a reason for its over-use, e.g. in science fiction movies. 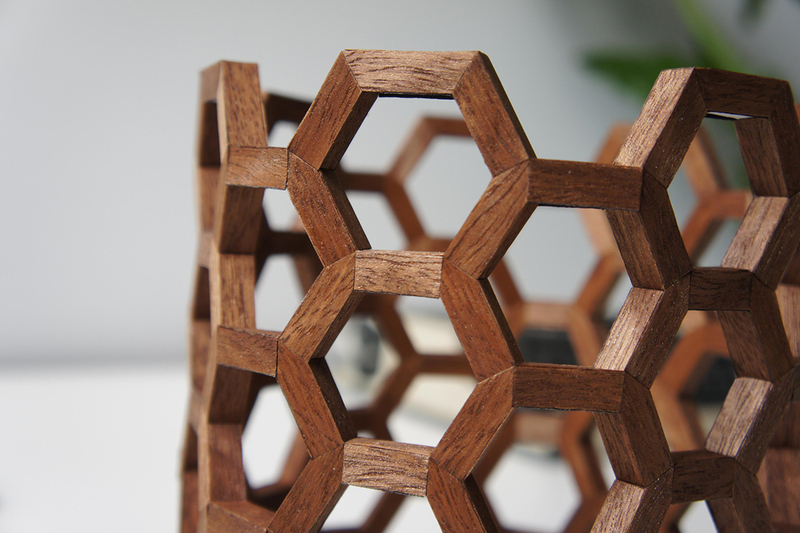 Here they tessellate to form a 14-sided, faceted cylinder. 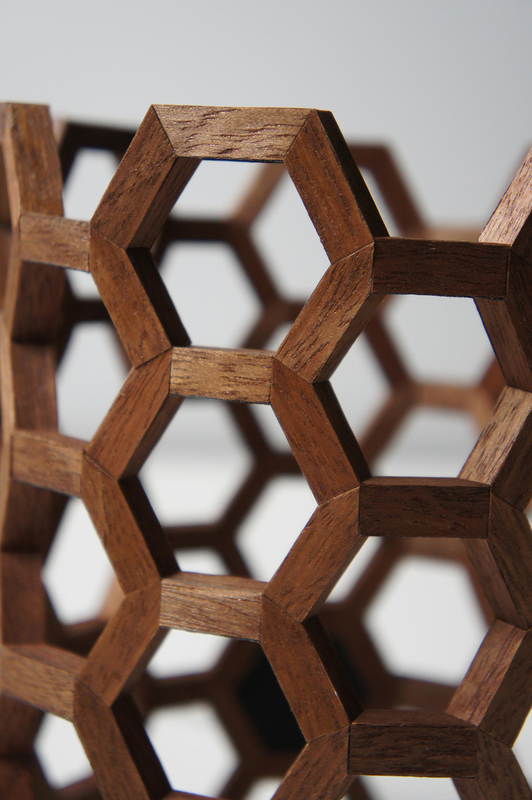 There's also a rationale behind the hexagonal holes. Originally, the cylinder had vertical bars running the whole height. However, the light from each hidden LED at the top would cause an obvious gradient of brightness from the top to the bottom of the inner sides of the bars, destroying the illusion of light emanating from the space within the cylinder. The solution was to angle the sides of the bars such that the top and bottom areas are now evenly illuminated. So the structure almost suggested itself. 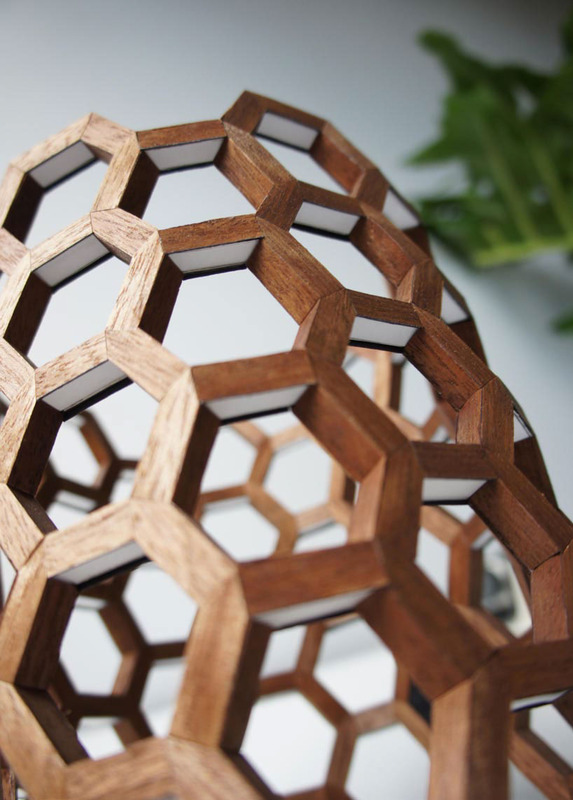 The 6-sided holes also make people assume that the unseen sixth side is also opaque wood, like the other five sides; when it is in fact plastic or paper that light can shine through. One of the hexagonal holes is inlaid with a black rubber piece with a cable coming out of it. An anachronistic, chimerical fusion between electric technology and antique history. The lamp runs on a 12 volt power supply. When not in use, the openwork structure lets light pass through, casting intriguing shadows -- recalling the windows that inspired it. The way it interacts with light in its dormant state adds another layer of meaning to the object. Switched on, the structure turns into a cage for luminous emptiness. 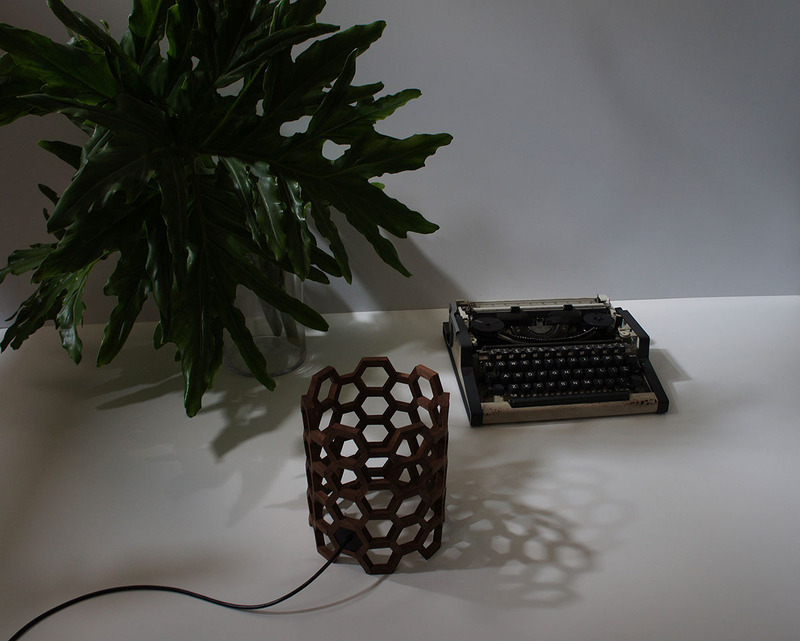 Essentially, the lamp uses the table surface it's placed on as a reflector to diffuse light. In its normal context of use like on e.g. living room table tops, the lamp will be viewed from a height such that the underside LEDs are always out of sight. However, their presence will be given away by reflective surfaces like glass, as tell-tale reflections; so the lamp is best paired with non-glossy table surfaces like unvarnished wood or matt-finish laminate. For me, what’s interesting is the light itself, not the means of producing it. LED just happens to be a technology that makes this concept possible; it is not my aim to fetishize any particular technology. There is no need for a lamp to scream to the world that it uses LEDs or incandescent bulbs. Some ironic concepts might call for that approach, but this is not one of those. Rather, it tries to be a subtle and subdued response to exciting developments in lighting technology miniaturization. Should an even better technology get invented in the future (as it most certainly will), I would gladly abandon LEDs for it. Yet even then, the meaning of the concept will still remain the same. The technology is always secondary. LEDs also have an intense glare that is visually disturbing, so it makes more sense to discreetly conceal them than to show them off. There's nothing "dishonest" about that. For me, LEDs just make it possible to do away with the singular light bulb that has always called too much attention to itself, to break it down into tiny pieces and embed them into the thickness of the ‘shade’. In a sense, the bulb is dematerialized; and only light and space remains. 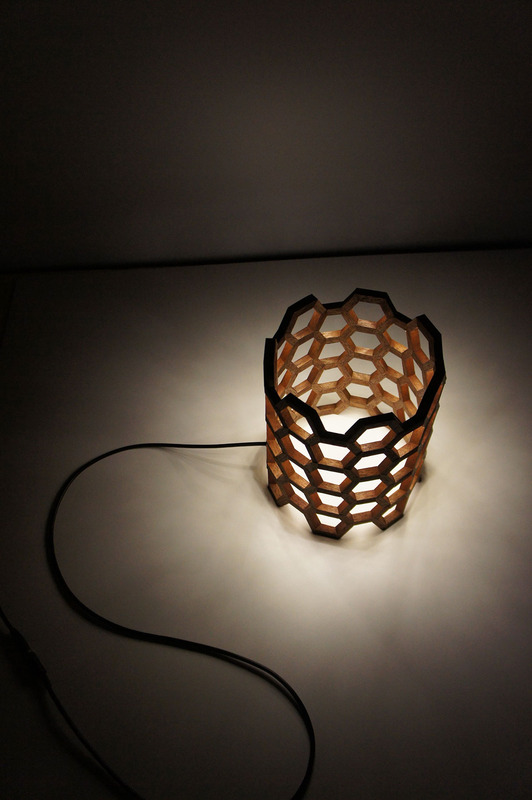 A wooden lampshade encloses an enigmatic emptiness, rather than the usual obtrusive light bulb.